This Englesrufer Pendant will make the perfect gift. 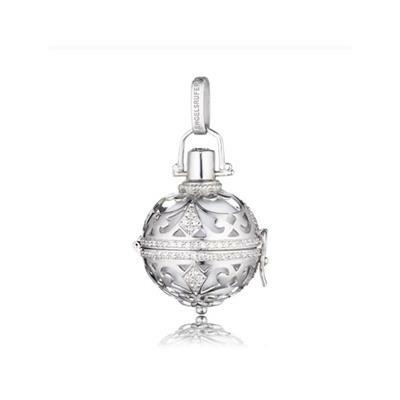 Engelsrufer, or Angel Whisperer are beautiful ornate lockets encasing a chiming sound ball, designed to bring calm and clarity to your day - the distinctive chiming attracts your chosen Guardian Angel, with each interchangeable sound ball having its own angel. This locket is crafted from Rhodium-Plated 925 Sterling Silver with a stunning filigree design and 95 White Cubic Zirconia crystals. This pendant comes with a white sound ball, signifying purity.